People are being drawn to South Carolina's coast in ever increasing numbers. Between the years 1960 and 2010, the population of coastal counties in the United States is projected to grow from 80 to 127 million people. Population growth creates a number of environmental problems, including nonpoint source pollution, nutrient enrichment, resource depletion, and habitat loss or fragmentation. Coastal zone managers are aware of the potential for increasing human-induced stress in our coastal ecosystems. They need information, in an accessible form, to determine how present and future land use can affect the conservation and protection of various habitats and their associated biological resources. The Ashepoo-Combahee-Edisto (ACE) Basin of South Carolina has a largely undeveloped landscape consisting of extensive, diverse habitats, such as saltwater and brackish-water marshes, maritime forests, upland pines, and bottomland hardwoods. These ecologically important attributes, coupled with management goals that balance conservation of natural resources with economic development and population growth, have made the ACE Basin the focus of national attention. A number of organizations and local citizens have been instrumental in the conservation of the ACE Basin; these include the South Carolina Department of Natural Resources (SCDNR), The Nature Conservancy (TNC), Ducks Unlimited (DU), Colleton County, and the U.S. Fish and Wildlife Service (USFWS). Through these and other organizations, nearly 10 percent of the upland and wetland habitats in the Basin have been permanently protected by purchase and conservation easements. Local community leaders have been responsive to this effort and created the ACE Basin Economic Forum with these goals: establish a framework for responsible growth, enhance awareness and appreciation of the Basin, and promote environmentally compatible business development in the area. This is particularly important considering that a population increase in the ACE Basin will undoubtedly lead to human-induced stress on its ecosystem. Residential and urban land use in the ACE Basin study area increased by over 4,940 ha (2,000 ac) between 1989 and 1994. 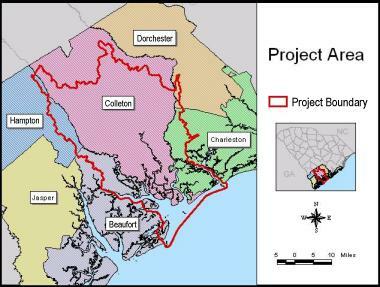 Colleton County, in which the majority of the ACE Basin study area is located, is expected to increase from a 1990 population of 34,377 people to over 47,500 people by the year 2010. Stressors associated with population growth include habitat loss, resource depletion, nonpoint source pollution, and nutrient loadings to estuaries and coastal waters. 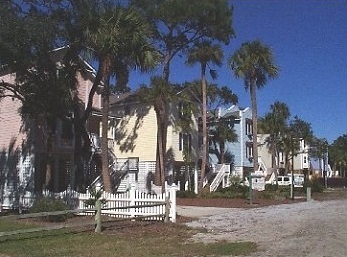 Areas of rapid population growth are centered within an hour's drive north (Charleston) and south (Beaufort) of the ACE Basin study area, creating the potential for rapid urbanization within the area. People are attracted to the mild climate, rural character, affordable land prices, recreational opportunities, and natural settings available in the vicinity of the ACE Basin, yet population growth and urbanization may affect the very things that attract people to the area.